Not All Those Who Wander Are Lost: What an Artist!! Earlier this morning I received an email from a Basenji friend who lives in the southern state of Texas and this is what the email contained. I wanted to share it with everyone here. This is an absolutely gorgeous photograph!! 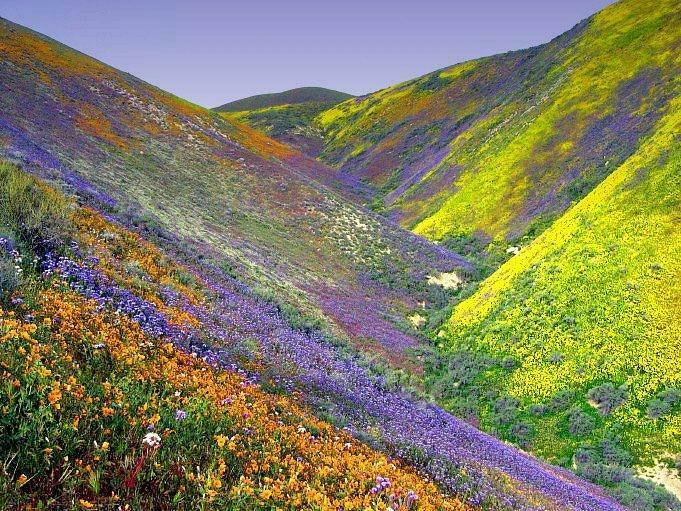 The east side of the Carrizo plain, in the Temblor Range, about 50 miles due west of Bakersfield, California. Don't know who took the photo, but it is definitely a breathtaking photo. Nothing man can do could ever equal the glory of God's creations. Truly the work of the divine hand. No human could create such wonder. We can only try. God spilled the paint all right. Beautiful. Thanks for sharing. Ditto to all the previous comments - what a sensational picture, and great description. Imagine the awesome beauty of His creation and how much more He loves us!